The Conveyor Junction is a device which allows the transfer of items from one inventory to another through conveyor ports. The small ship variant features six small ports and four large ports, while the large ship variant simply features a large port on each side. Note that it has no control panels or interfaces to interact with. 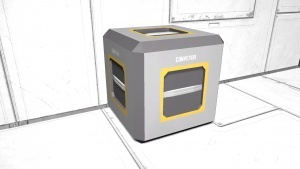 The Conveyor Junction automatically allows items to be passed through as soon as its construction has been completed, as long as the grid (ship/station) it is being placed on has power. 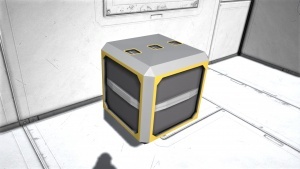 Like other conveyor blocks, it is also capable of transferring Oxygen and Hydrogen. See Conveyor Mechanics for more information. 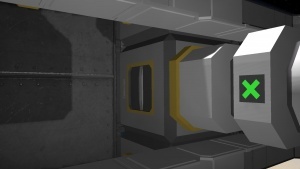 On large ships, this block is helpful when linking together multiple separate systems into your conveyor network. On small ships, it's helpful both in linking together multiple systems and in serving as a link between systems using small and large conveyor ports. Small Conveyor blocks and large conveyors cannot directly connect with each other. The only way is to use a block with both large and small conveyor ports, such as a Medium Cargo Container or a Conveyor Junction, as the junction point between them. All conveyors require power to function. However, interestingly enough the conveyor blocks do not have any power consumption. So while it does need power to pass items through it, it won't actually drain any power from the grid. This page was last modified on 14 February 2019, at 11:43.